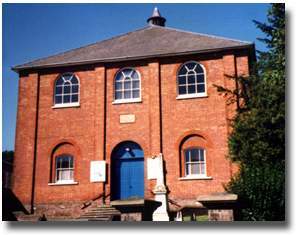 We ... Protestant Dissenters ... desire that the dwelling house of Mr. James Young in the parish of Tring be licenced for a place to be used for public worship and service of God. 19th March 1753. Jas. Young, Thom. Holloway Marshall, Jas. Kitley, Benj. Brittain, Jos. Seeley, Josiah Sale, Rob. Nichols, Jonathan Harding, John Rose, Wm. Adams, Jos. Priest, Hen. Biggs, Joseph Austin. Tring. A house at Willston for Protestants [Methodists]. 16th October 1818. Edw. Foster, Thos. Butcher, R. Granger. Thos, Caughtory. Lending Libraries at all the Sunday Schools, but not much used. Great numbers of the adults, as well as of the children cannot read. There is a Bible Society and a Temperance Society - but all is feeble. This place painfully illustrates the paralyzing influence of Ultra Sentiment. The different bodies of Christian professors are controversial, captious and disunited. Sunday School teaching seems lamentably deficient in character. The public religious taste is perverted. Illiteracy and Ignorance prevail. There was a British School but it has been allowed to expire. An Infant School followed it which seems likely to share a similar fate. Long Marston is irreligious and immoral as might be expected from the general apathy of the neighbourhood. This concentration of nonconformity means that may people researching their ancestors in the area find progress further back difficult. Before 1837 (when birth registration was introduced) there are no surviving birth or baptism records for a significant proportion of the people living in the Tring area. See Where is my ancestor's baptism before 1837? The High Street Baptist web site currently contains no historical information. 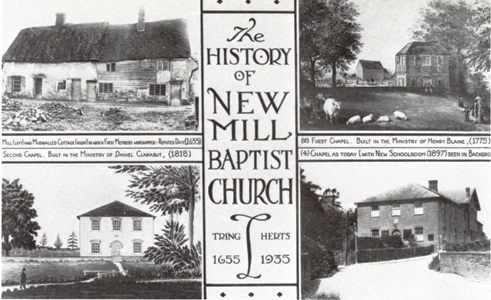 The New Mill Baptist Church web site includes a detailed history. St Martha's Church [Methodist] web site currently contains no historical information.